This book examines the historical roots of clerical work and the role that class and gender played in determining professional status. ""Transcribing Class and Gender"" explores the changing meanings of clerical work in nineteenth-century America, focusing on the discourse surrounding that work. At a time when shorthand transcription was the primary method of documenting business and legal communications and transactions, most stenographers were men, but changing technology saw the emergence of women in the once male-dominated field. Author Carole Srole argues that stenographers - from court reporters to so-called typewriter girls - were in a unique position to construct a new image of the professional man and woman and that, in doing so, they redefined middle- and working-class identities. 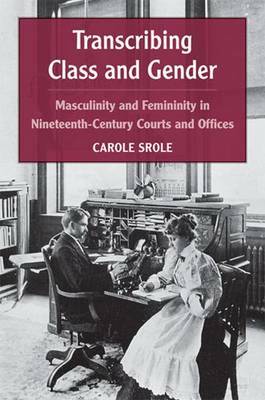 By reading and analyzing stenography trade magazines, archives of professional associations, popular fiction, and writings from educational reformers, Srole challenges the common assumption that men and women clerks had separate work cultures and demonstrates how each had to balance elements of manhood and womanhood in the drive toward professionalism and the construction of a new middle-class image.